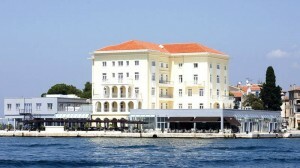 The prestigious four-star Hotel Palazzo, the oldest hotel in Porec, has an exclusive waterfront location in the old town centre. The hotel was built in 1910 as a luxury hotel and reconstructed in 2009 to offer its guests top-quality comfort, elegance and style. 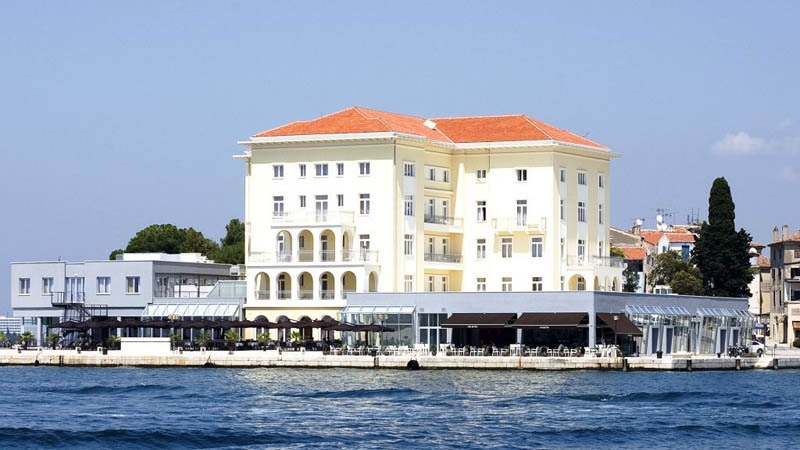 The front of the hotel offers beautiful views over the bay and the island of St. Nicholas and the back of the hotel shows you the lovely cobbled streets of the old town. 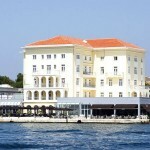 Historical Porec is a living cultural monument, its foundations dating back to the Roman Empire. This city has so much to offer that it is impossible to get bored. Beautiful old squares, palaces, centuries old monuments and interesting museums and galleries are waiting to be discovered by you. Don’t miss the highlight of the town; the Euphrasian Basilica, a UNESCO World Heritage Site, with its magnificent Byzantine mosaics and stunning view over the town and the sea from its bell tower. Cosy little restaurants, cafés, bars and nightclubs also contribute to the special atmosphere in the old town centre. 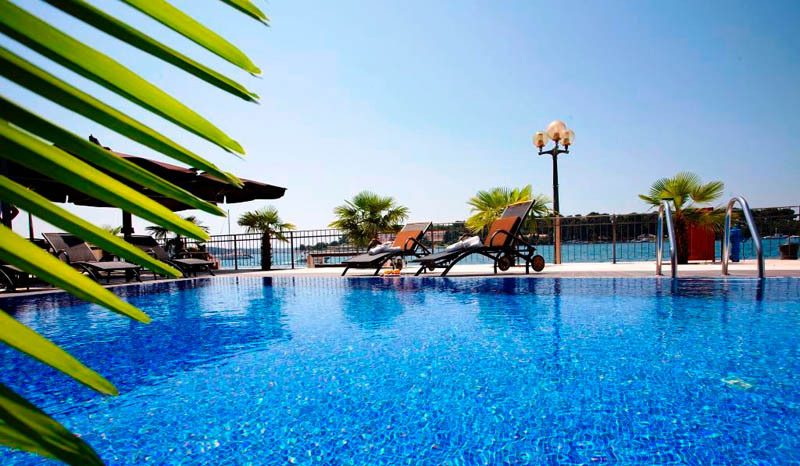 The Porec riviera is well known for its many Blue Flag beaches; on the island of St. Nicholas, which is only a 5 min boat ride away, the Gradsko Kupaliste (City Beach) and the Zelena Laguna and Plava Laguna. These beautiful lagoons are surrounded with pine forests, located just a few kilometres from Porec. 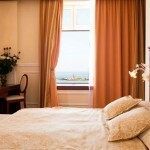 The hotel offers 70 luxury rooms and 4 spacious suites. 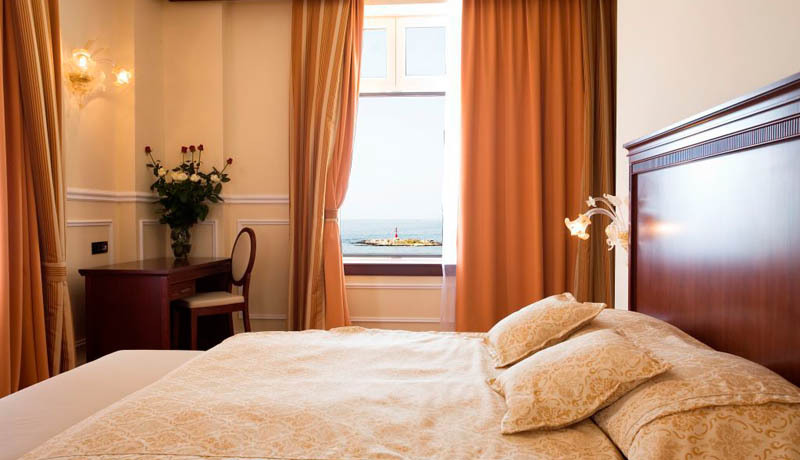 Most rooms and suites have a balcony or terrace with sea view or with a beautiful view over the old centre of Porec. The rooms and suites offer: flat screen TV with a large offer of international channels and Pay-TV, seats, air conditioning, a desk, telephone, safe, mini bar, free high-speed Wi-Fi, floor and wall heating, hairdryer, telephone. In addition, the suites offer a separate seating area, a flat screen TV in the seating area and in the bedroom, hydro-massage tub, wellness shower and steam bath and the possibility to connect to a second bedroom. The hotel’s a la carte restaurant “Parenzo 1910” offers a variety of Mediterranean and international dishes, seasonal local dishes, fresh caught fish, premium Istrian truffles and local and international vintage wines. Enjoy your breakfast buffet on the seaside terrace with a beautiful view of St. Nicholas Island, or a romantic candle-light-dinner during sunset. During the day the pool bar at the open-air pool offers light and healthy dishes, fresh juices and summer-drinks. Café and Gelateria “Café del Mar” offers home-made ice cream, international coffee specialities and at the “Vienna” cocktail bar you can spoil yourself with a refreshing cocktail or a glass of champagne. Hotel Palazzo will offer you a truly luxurious hotel experience with its wide offer of spa and wellness treatments. Whether you choose an aroma-oil-massage, anti-stress massage, anti-cellulite massage or one of the many other massages, you will feel relaxed and pampered. To clean, refresh and nourish the skin the wellness centre offers various types of skin treatments and body-peeling to suit your skin type. For the mature skin there are special anti-ageing treatments such as the indulging “Caviar-lift”, “Wine-ritual” or “Gold-ritual”. 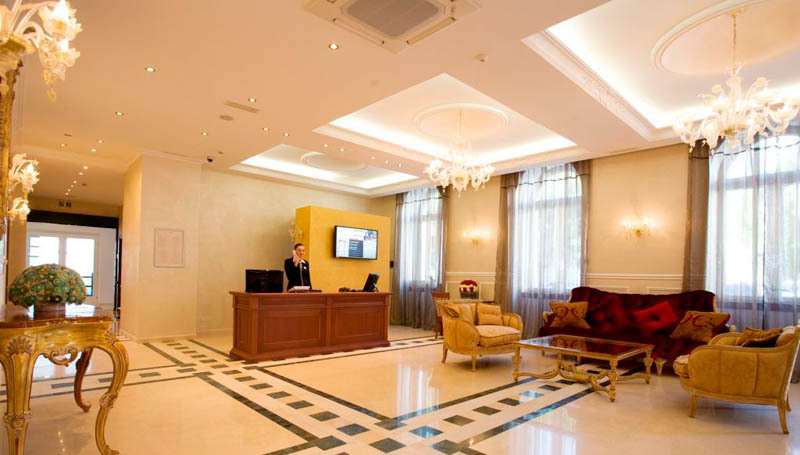 Amongst Hotel Palazzo’s services are 24 hour reception, room service, concierge service, laundry service, free internet, event and excursion programs, nursery services, parking at the hotel and airport transfers. The stair free hotel accommodates disabled guests.